Hamster Club :: Hamster Club New HAMSTER BOOK! Only €4.99! Hamster Club New HAMSTER BOOK! Only €4.99! 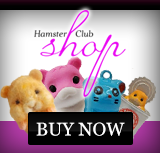 Hamster-Club.com is proud to announce that it launched its new hamster book for all hamster lovers! 'Hamster Club Guide Book' is the ultimate best hamster book for all hamster owners, since it provides lots of expert hamster advice. This hamster book will help you with most aspects of hamster housing, feeding a hamster, hamster behaviour, hamster reproduction, hamster health and hamster important tips! This hamster book is also full of beautiful coloured hamster photos and also provides lots of natural remedies to use when a rodent vet is not available. Price: only €4.99! (approx £4.30 / $6.56). Click here to view the first ten pages, front and back covers of 'Hamster Club Guide Book'. Books are posted within 24 hours (weekdays). We are based in Malta and post internationally. We would like to thank all those that helped us in creating this hamster book. A special thanks goes to Klara Salamońska too for allowing us to use her hamsters' pictures. 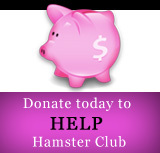 Click here to view our first hamster book newsletter!